Besides his famous quotations such as 'ten players play a better game than eleven' or 'we'll win the match without even getting off the coach', he is remembered for the attractive one-touch game which astonished Europe in his first two seasons with the Club. His first period began on 22 April 1958, when he arrived from Sevilla. Over these two years he won two leagues, one Cup and two Fairs Cups. But not everything ran smoothly for the coach. He had a confrontation with Kubala, who was gradually losing popularity. In his second year, despite winning the League championship again, the team's aim to win the European Cup was frustrated after losing against Barça's eternal rival, Real Madrid. Helenio Herrera was dismissed immediately. His most brilliant period as a coach came later, with Luisito Suárez's Inter, a period in which he won the European Cup, the Intercontinental Cup, amongst other trophies. He returned to Barça in the 1979-80 season to substitute Quimet Rifé and then again in 1981, to replace Kubala as coach. If there is one feature that should be highlighted about this man, it is that he pioneered the psychological preparation of the players, as well as the use of a sweeper. 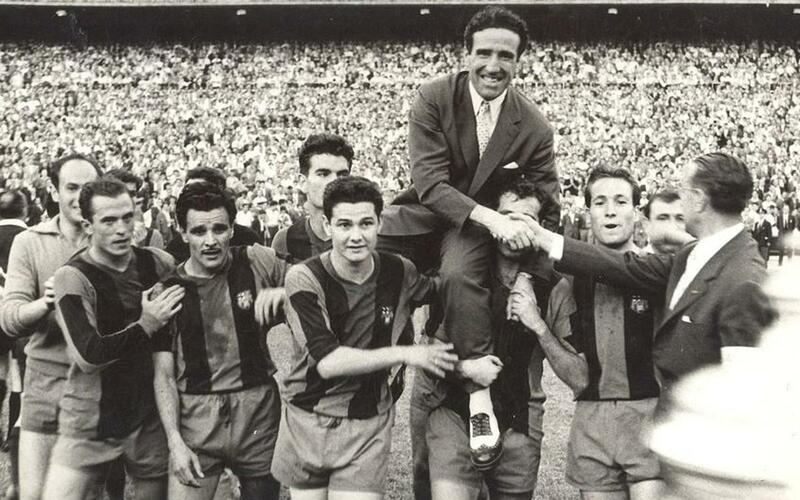 Helenio Herrera always had a very good relationship with the players because they had come to terms with the fact that the coach would always be in the limelight of their success.